Last week the U.S. Treasury Dept. issued new sanctions that are expected to force ExxonMobil to halt its current Arctic drilling operations, a $700 million dollar partnership with Russian energy company Rosneft. 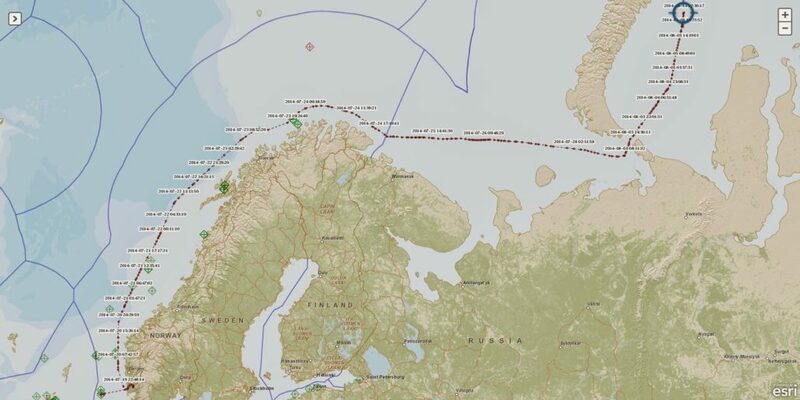 Earlier sanctions only applied to new financial transactions and therefore did not stop the energy giants from moving the West Alpha drilling rig hundreds of miles north of the Arctic Circle to begin drilling for oil in the Kara Sea. On August 9, Vladimir Putin gave the go-ahead to start drilling in the Universitetskaya (Университетская) Prospect, making this venture the northernmost oil well in Russia. However, ExxonMobil now has just until the end of the month to wrap up their operations. ExxonMobil and Rosneft planned to complete the project during the brief ice-free season between August and October. In early July, barely a month before the West Alpha rig arrived from Norway, the Kara Sea was still covered in ice (above). As we’ve written before, there are a number of reasons to be concerned about drilling in the Arctic. We’ve seen the devastation caused by a blowout in the relatively calm waters of the Gulf of Mexico, and this drilling operation is 385 miles northeast of Gazprom’s controversial Prirazlomnaya platform that Greenpeace activists boarded last year. What is so worrying about drilling in the Arctic? Aside from the unforgiving weather that can tear a 28,000 ton drill rig from its support vessels and drive it ashore, there are no technologies proven to clean up spilled oil from the ice that covers the region most of the year. And this ice is always moving: consider what the Kara Sea looked like in July (above) compared to August (below). At 68² km, the 11 km long chunk of ice identified above is larger than Manhattan. 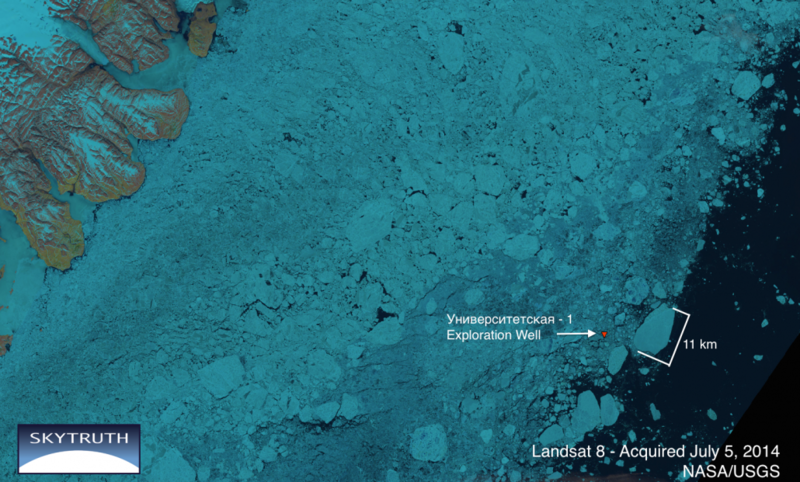 According to Rosneft, the West Alpha rig is outfitted with sensors to track advancing sea ice, and they claim to be able to shut-in the well and move the rig if necessary. (Above) As of August 22 the ice had retreated. Looking at Landsat’s 15-meter panchromatic band (Band 8), we can just make out the rig and several support vessels. 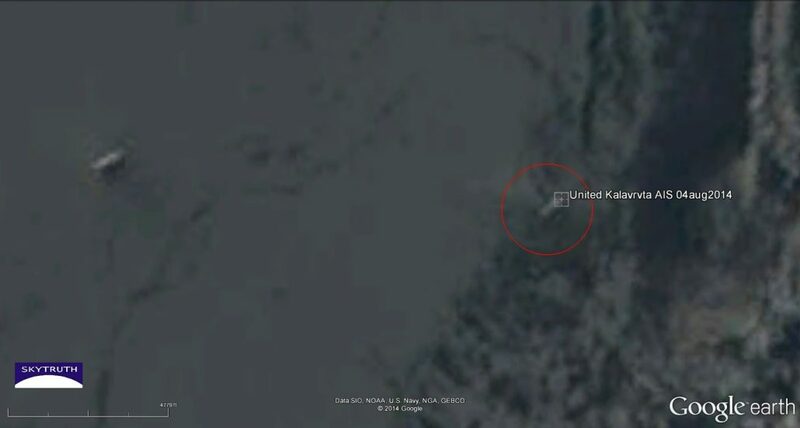 We’ve been able to definitely identify the two vessels east of the rig. The furthest vessel to the east is the REM Supporter and the vessel in the middle is the Loke Viking. The identity of the vessel right beside the rig is unknown. 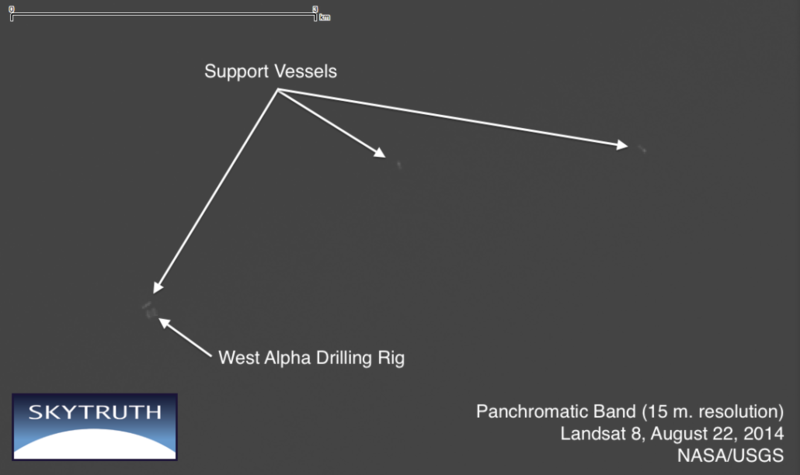 It is worth noting that the West Alpha rig has not broadcast its location since August 14. It is not to clear to us from the IMO regulations if they are required to continually broadcast their location until they are safely back in port, but it is not uncommon for drill rigs to stop broadcasting when they are “on-station” and not moving. According to Rosneft, drilling began in early August and was expected to take two months. But under these new sanctions Exxon has to wind down their activity and secure the well by the end of September. 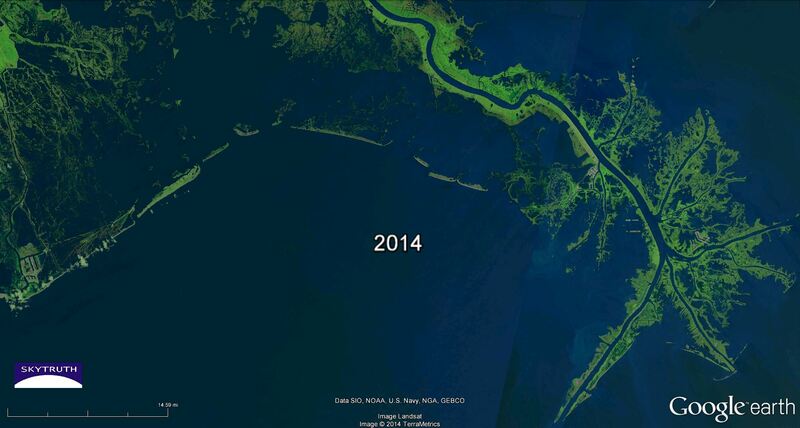 Like many folks, we were astonished by the recent ProPublica / The Lens mapping work showing the tremendous loss of marshland in the Mississippi Delta and adjacent parts of the Gulf coast. There is an unholy alliance of factors responsible: the rise in sea level due to melting onshore glaciers and icepack, and thermal expansion of the ocean, two consequences of global warming; the natural, inexorable subsidence of the Delta as that huge pile of sediment compresses and sinks under it’s own awesome weight, actually depressing the Earth’s crust; the diversion of Mississippi River sediments away from the marshes and out into the Gulf, thanks to an impressive system of dams, levees, and pumps designed to control flooding and aid navigation; and the accelerated erosion of marshlands thanks to the criss-crossing network of ditches and canals dug willy-nilly by the oil and gas industry over many decades — the death by 1,000 cuts. This last factor has prompted some of Louisiana’s coastal parishes to sue the oil and gas industry, a “bite the hand that feeds you” course of action that might have been unthinkable just a few years ago. But desperate times breed desperate measures. There is an ambitious $50 billion plan to “fix” the Delta. The billions of dollars in Clean Water Act fines that BP and their partners will pay for the 2010 BP / Deepwater Horizon oil and gas disaster could provide a solid downpayment on this recovery plan. 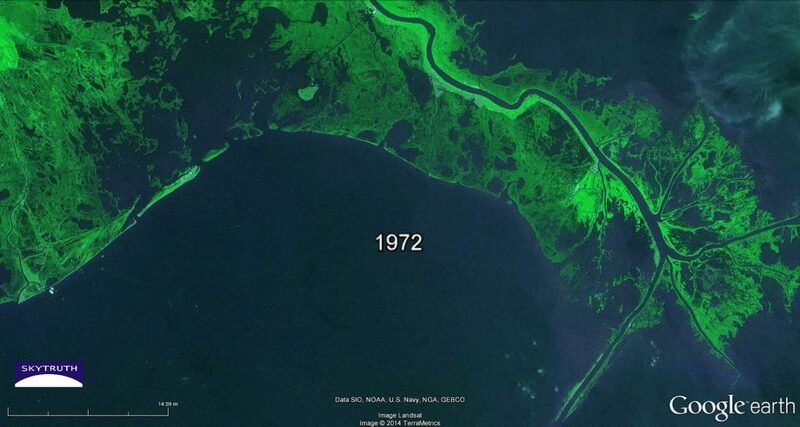 <1972: Mississippi Delta and Louisiana coastline as seen on August 7, 1972, just 15 days after the launch of the first Landsat Earth-imaging satellite. 2014: This mosaic of two images collected by the Landsat-8 satellite in 2014 starkly illustrates the loss of marsh vegetation (green) over the past four decades. At the suggestion of Rob Simmon from NASA, we’ve produced a view of the United Kalavrvta from August 4, 2014, using the high-resolution panchromatic band (Band 8) of the Landsat-8 image. Much sharper, as expected. And now we measure the vessel length on the image at 282 meters — very close to the 275-meter length reported by Fleetmon for this supertanker. 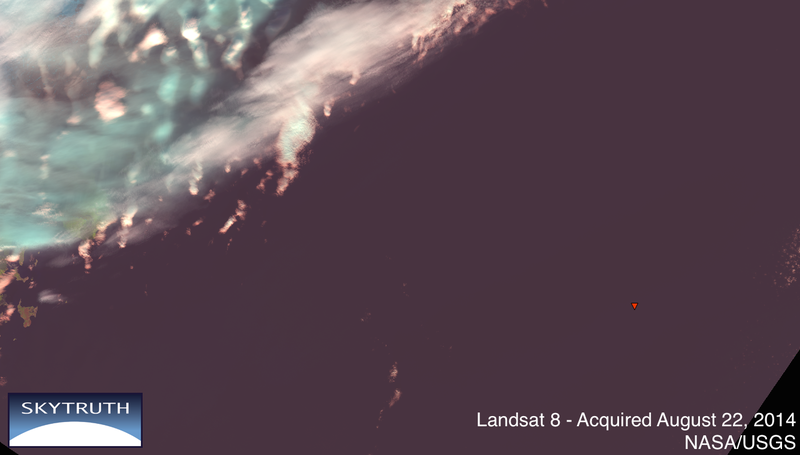 Detail from Landsat-8 image taken August 4, 2014. Panchromatic band (15 meter pixels). United Kalavrvta marked by red circle. A similar-sized vessel also appears to be anchored about 4km to the west. Compare with multispectral image below. Matching detail from multispectral (visible band) composite with 30 meter pixels. Playing Hide-and-Seek! With an Oil Tanker. Supertankers loaded with crude have been making the news recently, mostly because they can’t find a place to sell the stuff. These tankers departed from Kurdistan, but Iraq claims the oil they carry is their property and the Kurds don’t have the right to sell it. 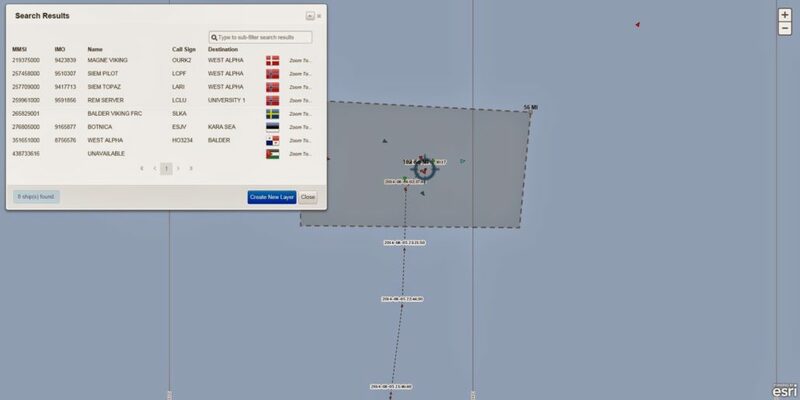 This global political dispute is playing out on the water in an interesting, albeit risky, way: the tankers are unable to come into port, so are lingering offshore, fully loaded, waiting for some kind of resolution. Late in July, we tracked the tanker United Leadership as it roamed across the Mediterranean and loitered in the Atlantic off the coast of Morocco. A Coast Guard official said the vessel in the Gulf of Mexico might have turned off its beacon, sailed beyond antennas that monitor transponders, or perhaps some antennas might have been taken out of service. Um, that’s not quite right: tankers are required by international maritime law, AND by US Coast Guard regulations, to continually broadcast their position, heading, speed and other information using a Class A AIS system when they are between ports. There should be no threat of piracy in the US Gulf of Mexico, so the captain has no legal justification for turning the system off, until the vessel is safely in port. Which it is not. 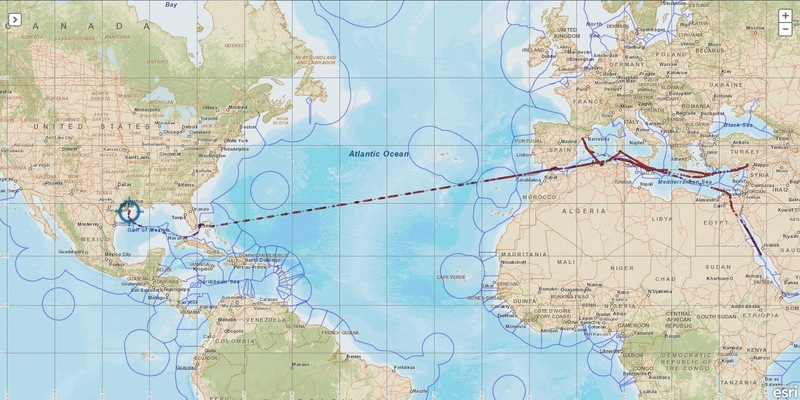 And the AIS signals sent by the relatively powerful Class A transmitters on tankers and other large cargo vessels are readily picked up by AIS satellites, which can cover the entire ocean. 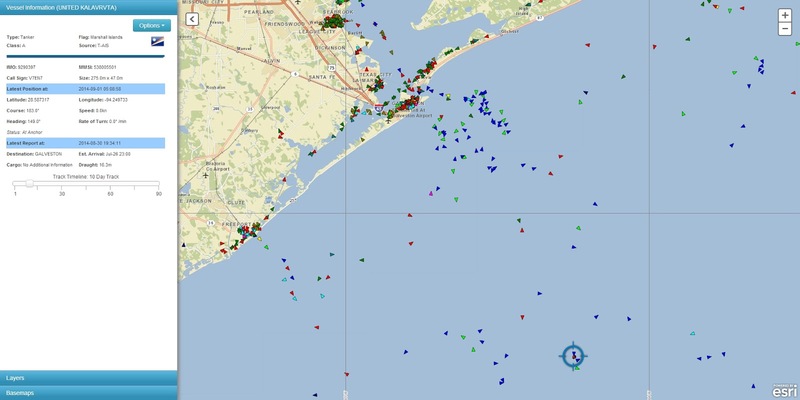 If the captain turned off his AIS, perhaps the US Coast Guard needs to go pay him a visit and enforce US law. So where is the United Kalavrvta? Right where it’s been for weeks, since it showed up on July 27. See below for the details: our vessel-tracking expert Bjorn prepared this series of maps and info yesterday, using our satellite AIS data feed from exactEarth. We hope the Coast Guard can make use of this to resolve the inconsistencies in broadcasting by this loaded supertanker. After all, it’s hurricane season in the Gulf, and a fully loaded tanker that is not broadcasting its location to all the vessels in the vicinity is a hazard to navigation, and a potentially colossal environmental disaster waiting to happen. The United Kalavrvta is at anchor in the same location off Galveston. They resumed AIS broadcast but with some unusually long gaps between positions. Their last position was about 32 hours ago. Between the 26th and the 28th there was a 47 hour gap, between the 28th and the 30th there was a 53 hour gap. AIS data track showing path of United Kalavrvta over the past 90 days. 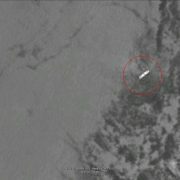 Just for grins, we thought we’d see if this vessel shows up on Landsat-8 satellite imagery. The most recent cloud-free image of this area was taken on August 4. Sure enough, the faint pattern of a large oceangoing vessel appears exactly where the AIS data say the tanker was located on that day. 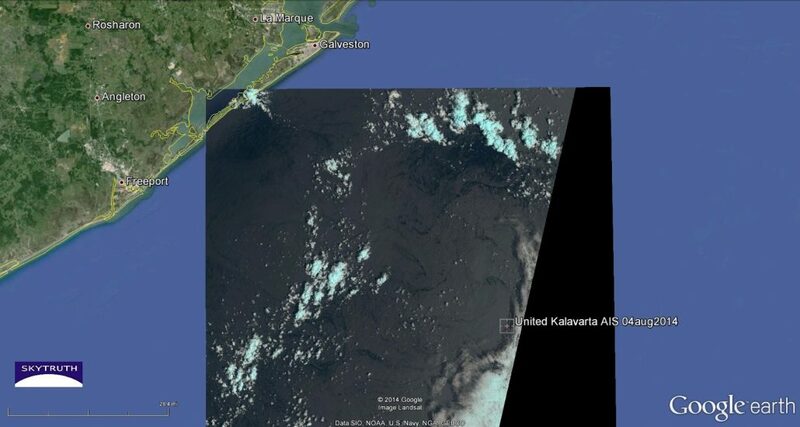 Part of a Landsat-8 satellite image taken on August 4, showing a vessel in the reported AIS position for the United Kalavrvta. 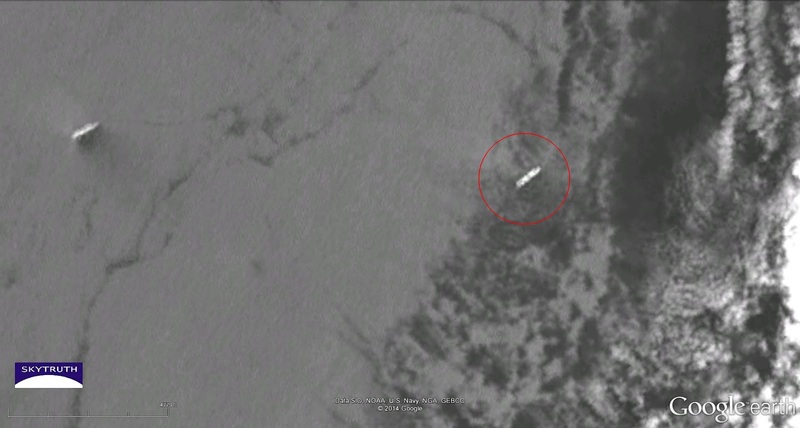 Detail from Landsat-8 image showing a large vessel (pale elongated blob) at the AIS position reported by the United Kalarvrvta on August 4, 2014. Vessel appears to be roughly 240 meters long. FleetMon data indicate United Kalarvrvta is 275 meters long. This is within the error of Landsat-8 imagery, which has 30-meter pixels. Note another, similar-size vessel at center left. /wp-content/uploads/2016/08/test_logo.png 0 0 John Amos /wp-content/uploads/2016/08/test_logo.png John Amos2014-09-03 19:45:002019-02-08 10:21:35Playing Hide-and-Seek! With an Oil Tanker.